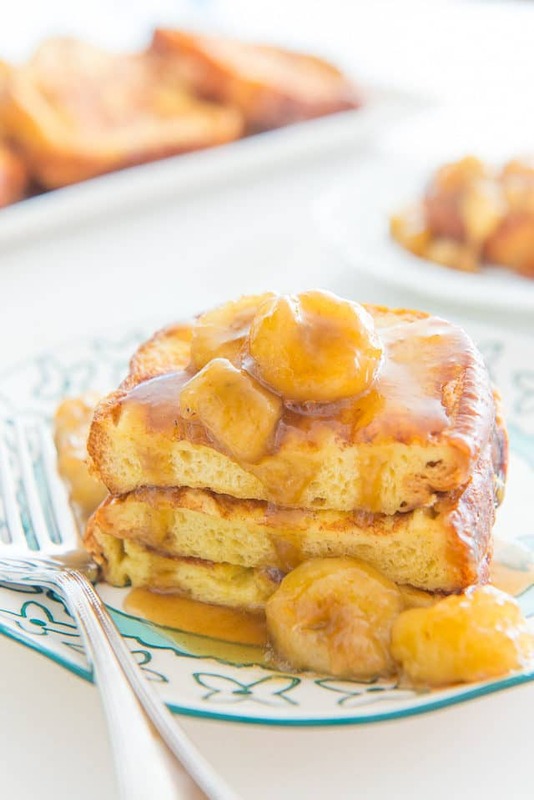 Bananas Foster French Toast is an indulgent cross between dessert and breakfast, combining a challah french toast with a sticky sweet bananas foster sauce. Perfect for a special occasion brunch! 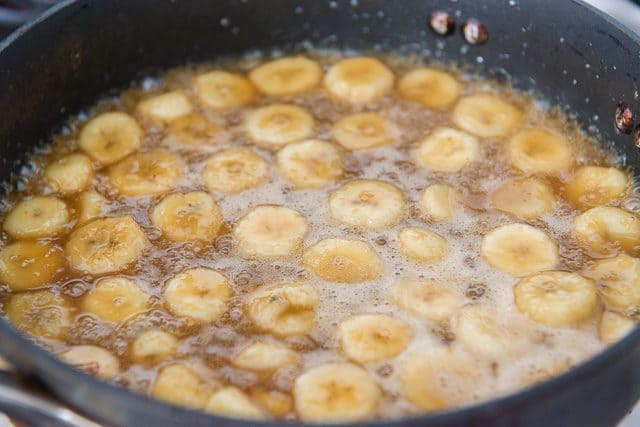 Bananas Foster is one of the earliest desserts that I remember loving as a kid, which is funny because in general I’m not wild about bananas. I guess if you cook anything in a butter brown sugar rum sauce flambé, it’s bound to be good. Yes? And there was always so much flashiness when we’d get it at the restaurant and they’d flame it right at the table. Ohhhhh, fire! In all seriousness, I think bananas totally transform with a little bit of heat, even if it’s just with 5 minutes in the pan. Case in point: I regularly make these Sticky Honey Bananas, cooked in a little coconut oil, honey, and cinnamon, for a few minutes on each side. It’s just enough to caramelize the bananas on the edges, and yield a soft and sweet middle. They’re heavenly. 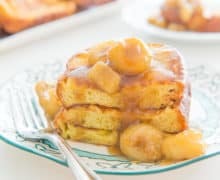 This particular brunch recipe celebrates the marriage of dessert and breakfast, and was born out of my serious love for bananas foster. One night after making bananas foster, I found myself left with a bunch of extra sauce, and didn’t want to waste it. 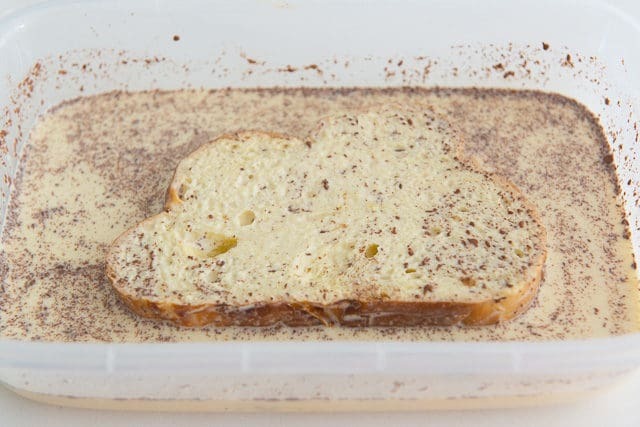 So I put it into a container and decided I would save it for drizzling over french toast the next morning. AND IT WAS SO GOOD. I’m a huge maple syrup fan, but this is something that’s a little different, also drizzles beautifully, and feels like a special occasion breakfast treat. I say the special occasion part because it’s definitely calorie city, but when it’s mother’s day or a birthday or another special day, I think splurging a little is the only way. 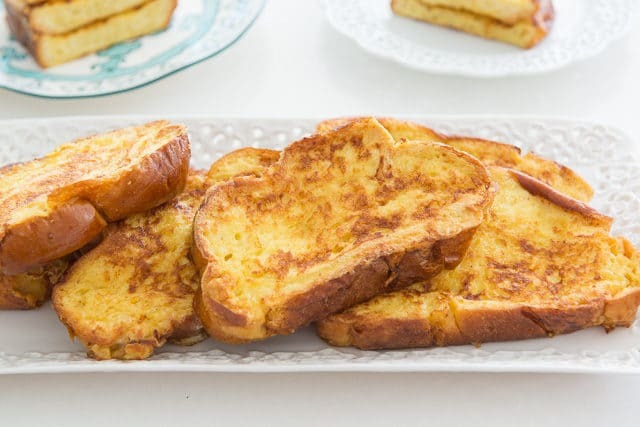 Start by making the challah french toast. 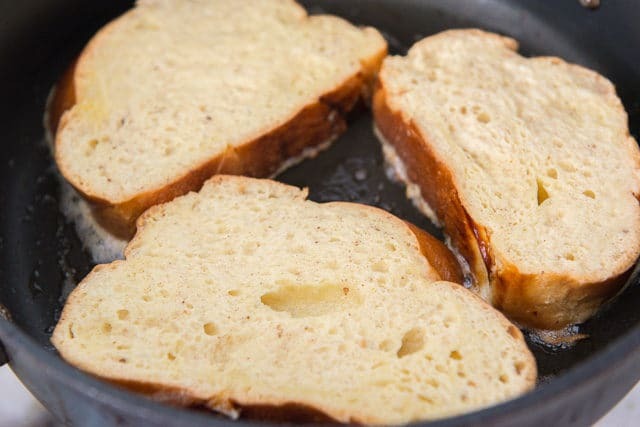 I don’t add any sugar to the french toast batter because challah bread is already sweetened. In my opinion, the best bread for french toast is hands down challah! 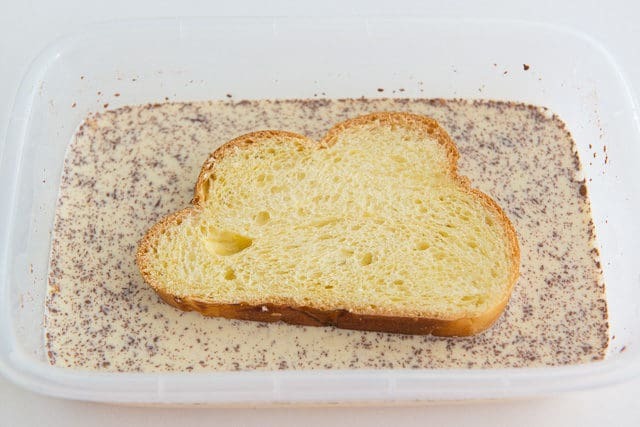 And a quick tip: if you want to soak a whole bunch of challah at one time, put the custard into a rimmed half sheet pan, and lay out all the slices at once. You want to use bananas that are *just* ripe, with no spots on the peel. If you use too ripe of a banana, the slices won’t hold their shape in the sauce. At the very end, add the rum and flame it, and cook for about a minute. When the flame burns off, that’s when the sauce is ready! 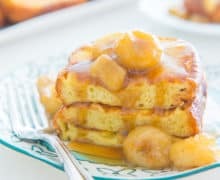 I also recommend Cinnamon Roll Pancakes and Chef Josh Capon’s Bacon & Cheddar Waffles for more delicious brunch recipes. Enjoy! 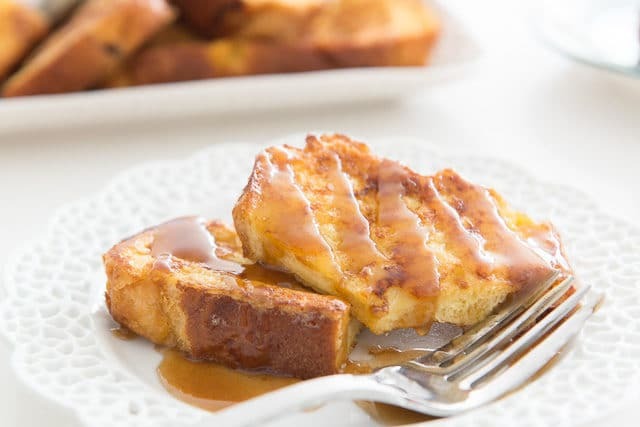 Bananas Foster French Toast is perfect for a special occasion brunch, and it's quick and easy to prepare. 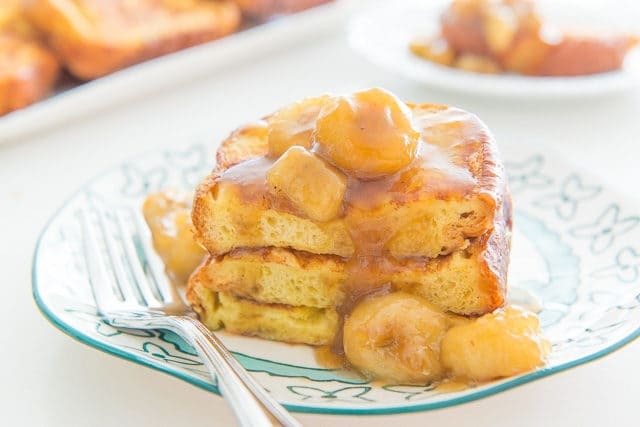 It's an indulgent cross between dessert and breakfast, combining a challah french toast with a sticky sweet bananas foster sauce that is spooned on top. 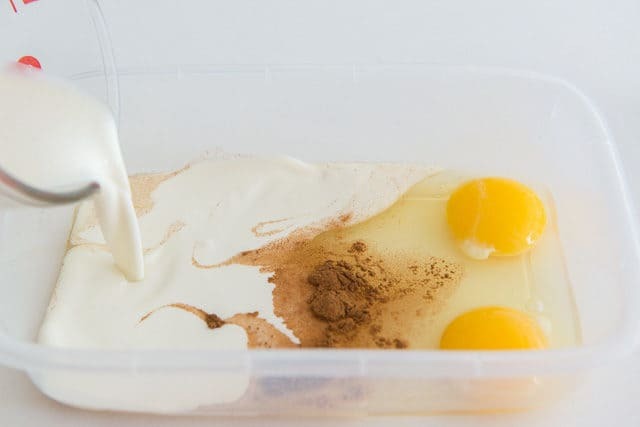 To make the french toast, whisk to combine the eggs, half and half, and cinnamon in a flat rimmed dish. Soak the challah slices in the mixture for 30-60 seconds on each side. 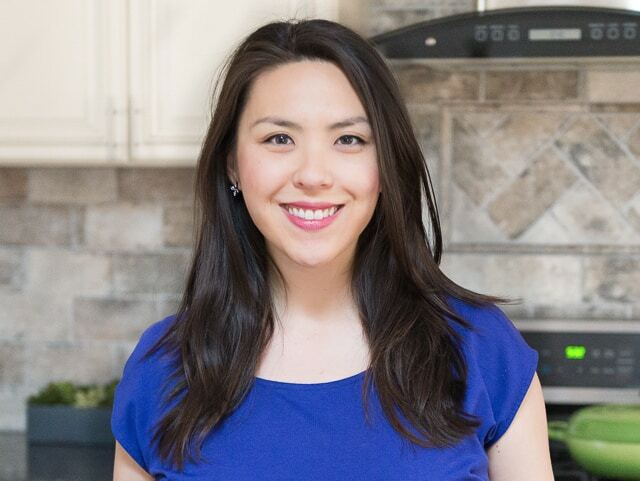 Heat a nonstick skillet over medium heat and melt about a tablespoon of butter, or enough to coat the bottom of the pan. Add the soaked challah in a single layer and cook for about 2 minutes on each side, until golden. 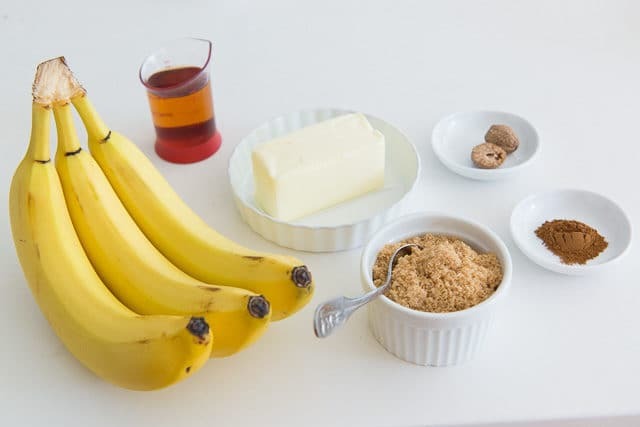 To make the bananas foster, in a skillet set over medium heat, add the butter, brown sugar, cinnamon, and nutmeg. Cook and stir until the butter is melted, a couple minutes. Peel and slice the bananas into ½” thick pieces. Add to the skillet and cook for 3 minutes on the first side, or until the bananas are golden on the bottom. Flip all the banana slices and cook for two minutes on the other side, until soft. Remove the pan from the heat and add the rum. Return the pan to the stove and tilt to catch the flame* and let the alcohol burn. Once the flame burns out, the sauce is done. 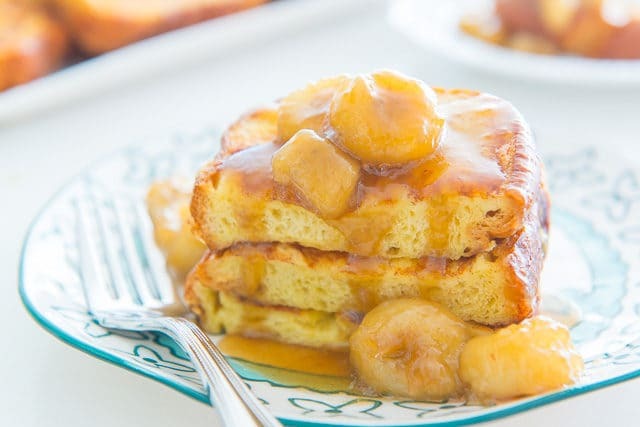 Serve the french toast with the bananas and spoon the extra sauce over the top. Enjoy! *You can also use a stick lighter if you don't have a gas stove. Life Lately #4: A Journey to see the Total Eclipse! Wow, what an awesome breakfast! Putting this on my list for this weekend! The breakfast of my dreams! Thanks for turning my favorite dessert into French Toast- yum! Such a heavenly recipe! These are just so good. The perfect weekend breakfast! Love this so much!